Up until this summer, Wonder Woman has evaded starring in her own dedicated live-action movie, much to the frustration of the character's fans and to those who've simply yearned for a standalone female superhero. Decades of development hell resulted in many failed attempts at getting an adaptation of Diana Prince off the ground, casting a dark cloud over the future of the Amazon hero eventually charging onto the big screen in all her glory. The closest that Wonder Woman has come to a cinematic presence over the years, serving as a faithful and uplifting substitute, can be found in Warner Bros.' direct-to-video animated origin story, Wonder Woman. Despite a few incidences of comic-book hokeyness and questionable choices behind how the voice-acting and scripting match up, Wonder Woman rightly captures many of the same ideas as Patty Jenkins' latest worldwide phenomenon -- check out my review here -- from fish-outta-water humor and idealistic vigor to plenty of mythical battles. While flawed and now bested, this Diana still stands tall. Keri Russell voices the Amazon warrior as Wonder Woman elaborates upon the hero's origin story, and it's going to look strikingly similar to those who've seen the latest live-action film ... just with a few tweaks, including to the time period. After a tumultuous history involving the Grecian gods and their conflict over the corruptibility of humanity, the Amazonian women remain distanced from the realm of man on the island of Themyscira -- Paradise Island -- an invisible place where the women remain eternally youthful and skeptical of humanity, There, Diana has been training for battle, yet hasn't earned the full respect of her people as a worthy and experienced warrior. Diana hopes to prove herself by taking a crashed fighter pilot, Steve Trevor (Nathan Fillion), back to the outside world, but her journey there becomes complicated as she must battle against the emerging God of War, Ares (Alfred Molina), who hopes to ignite the darkness and violence of man in the modern era. Similar to Suicide Squad, it wouldn't be surprising to hear that the screenwriters for Wonder Woman's live-action blockbuster debut used DC's animated film as a reference point, eve though both hearken back to the fundamentals of the character's origin in the comics. After a grueling depiction of the warfare among gods and the Amazons, amplified with grandiose dialogue and vivid warfare befitting a clash of the divine, the film takes a measured and inspiring approach to revealing how Diana earns the right to travel to the "Man's World" and return Steve Trevor after his plane crashes into their realm. Strong, idyllic visuals enliven Themyscira and the Amazonian atmosphere, which creates an appealing and meaningful backbone for Diana's emergence as the mythology-inspired hero who's shaped from clay and brought to life. It isn't hard to make the principled and battle-oriented whimsy of the hidden island appealing, but Wonder Woman really nails it. Keri Russell makes for a phenomenal Wonder Woman, too. Whether we're talking about the burgeoning champion of Themysciera or the unaware traveler to the Man's World, the tempo of her voice exudes that magic combination of confidence and idealism that plays into the hero's moral constitution. 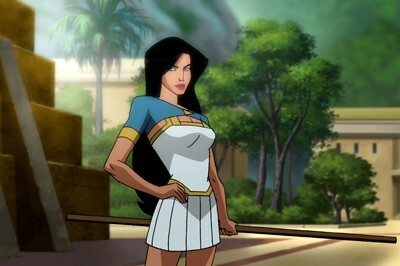 Russell's projection of that poise evolves as Diana copes with the challenges of winning over the Amazonian matriarchy in letting her take the journey and shifts further into the fish-outta-water interactions with Steve Trevor and his surroundings in America, and the actress effortlessly shifts between tones with a grasp on comedic timing, vulnerable strength, and gender-defying vigor. Channeled through Wonder Woman's traditional stars-and-stripes appearance, she becomes an admirable in-motion representation of the superheroine, embodying ideals about ugliness of warfare and masculinity that don't come across as preachy. It stings to admit this, being a fan of Firefly and of the actor's other indie turns, but the weak link in this iteration of Wonder Woman comes in Nathan Fillion's Steve Trevor. Now, Fillion does a bang-up job of embodying a roguish, womanizing fighter pilot, injecting his signature witty smarm into Trevor's stereotypical chauvinism. When combined with the scripting, however, this version of Steve Trevor lands too far into the realm of noxious behavior to believe that Diana could view him as a representation of humanity's hidden positive traits or, even more so, as a viable partner or love interest. That's a key fixture in the overarching story of Wonder Woman, and the scenes in which she begins to "warm up" to this version of Trevor feel born of obligation than of natural chemistry and development. Put simply, between his snark and persistence to win over Diana, it's hard to believe that Wonder Woman would become enamored with Fillion's Steve Trevor, and seeing her do so anyway manages to undercut her character's legitimacy. What this Wonder Woman lacks in the chemistry between the Amazon hero and her flawed human companion, it makes it for it in the vigorous battle sequences, especially in the explosive and visually arresting final act. The armies led by Alfred Molina's appropriately villainous Ares tap into rich, dark high-fantasy as they threaten the realm of man, yielding brutal battles between other-worldly forces of both good and evil that approach the kind of violence that pushes certain limits for younger audiences; the violence initially garnered an R-Rating, which was cut down in response. Superhero clichés involving last-minute saves and convenient solutions might prevent the action from happening in a more credible manner, but they're overshadowed by the script's crafty usage of mythology. DC elevates Wonder Woman's animated origin through how she confronts the will of the gods following her coming-of-age journey, and its ability to go toe-to-toe with the similarly-themed chaos of WB's recent live-action counterpart is a testament to its triumphs. 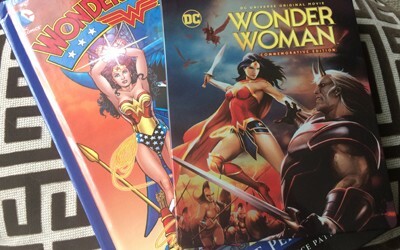 Rumors circulated several months before the release of this Commemorative Edition of Wonder Woman that the unedited, R-rated cut of the film could possible make an appearance, but that didn't turn out to be the case. While understandable considering the potential of a live-action Wonder Woman movie sparking interest in younger audiences, thus sparking their interest in seeking out the animated film and potentially discovering the increased violence of a new cut, it does diminish the appeal of such a re-release. Therefore, there's got to be something special contained within this Commemorative Edition to justify a purchase, considering the previous Blu-ray release (read DVDTalk's review here) can be had for the same or a lower price ... and considering one could feasible locate a hardcover edition of "Gods and Mortals", George Perez's terrific run of comics also centered on Wonder Woman's origin, that also includes the Blu-ray and DVD for, theoretically, $10 or so more; as of this writing, it's less than $2 extra: click here. Turns out, there really isn't much of a justification. 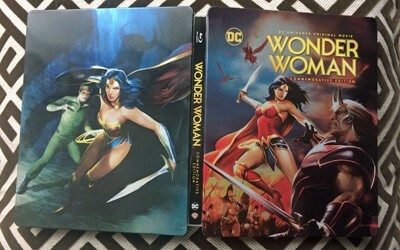 Pictured above, Target's exclusive steelbook of the Wonder Woman: Commemorative Edition includes both a Blu-ray and a DVD Copy of the film, featuring bland silver-topped artwork on both that duplicates Diana's fighting pose from the cover artwork. 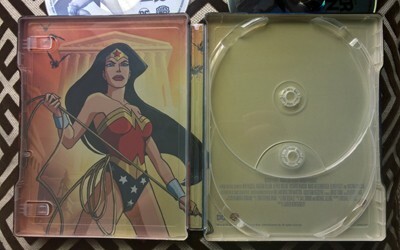 On the back, slick artwork of Wonder Woman and Steve Trevor in the same quasi-realistic style of the front cover; on the inside, however, a shot of Diana from the animated film fills out the left side underneath a Digital Copy slip. A slightly metallic finish adds interest to all the designs, though WB's new trend of including credits on the interior artwork -- luckily, hidden underneath the layered disc hubs -- once again detracts from the overall design. In all, it's an appealing steelbook presentation that collectors won't regret seeking out. 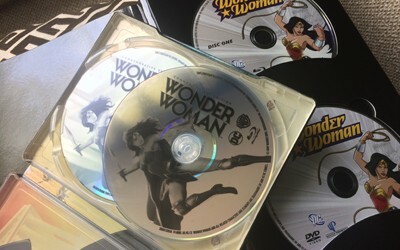 That Wonder Woman appears in a VC-1 high-definition treatment on this Commemorative Edition should tell aficionados pretty much everything they need to know about whether to pick this up or not: it's the exact same 1.78:1-framed, 1080p transfer, both the positives and the negatives, as the prior disc. It's a vividly colorful and endlessly sharp presentation that occasionally avoids some of the issues that plagued -- and every so often continues to plague -- WB's animated features, mostly lacking in distracting banding and sporting rich black levels throughout. The artwork's strokes and contours are somewhat thick and jagged, though, and the bitrate sporadically fluctuates from incredibly low to moderately impress mid-20s levels. From the vividness of Themyscira and the brooding reds of the underworld realm to the dark alleys and nighttime expanses of America, Wonder Woman remains a strong iteration of WB's animated catalog on Blu-ray. The 5.1 DTS-HD Master Audio ain't too shabby, either, and it has plenty of opportunities to flex its action-movie muscle throughout. Bass tends to be a bit thinner than one might expect, lacking punch during hand-to-hand combat and bombastic sequences, but the caliber of midrange clarity in staves connecting with one another, bodies slamming into walls, and other effects are punchy and possess enough weight to convince. Higher-end elements and other subtleties are more impressive, from the splintering of wood and the crumbling of rocks to the subtle beeping of a heart-rate monitor, and they proportionately spread out across the front-end and back channels in creation of slick ambience. Dialogue also lacks some lower-end response, but it's always clear and true, and does discover a little midrange bass with Alfred Molina's chatter as Ares. Along with restrained but immersive music that hits about the same levels of bass and clarity, it's a fine if unimpressive track. This Commemorative Edition of Wonder Woman has ditched many of the cursory extras from the previous release -- it lacks the loosely-pertinent cartoon episodes and the Green Lantern sneak peek -- but has retained the significant, character-specific and movie-specific ones. 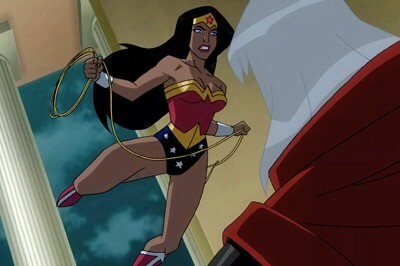 That includes the Commentary By the Film's Creative Team (Bruce Timm, director Lauren Montgomery, writer Michael Jelenic, and Gregory Novek from DC), which hits on interesting points about realizing the character herself and giving the film its grand scope, as well as a pair of lengthy, more intriguing featurettes: Wonder Woman: A Subversive Dream (25:36, 16x9 HD), a glimpse at the evolution of the character that spans from wartime diversion and creator William Marston's psychological roots to how she evolved during the rise of feminism in the ‘60s; and Wonder Woman: Daughter of Myth (25:40, 16x9 HD), focused on the lore of the character herself and how she factors in actual mythology. The only new extra centered on Wonder Woman comes in a featurette entitled What Makes a Wonder Woman (10:06, 16x9 HD), which updates the perspective on the character to both the developments in DC over the past decade or so and toward the live-action movie. DC exec Geoff Johns, the live-action Wonder Woman film's director Patty Jenkins, animated director Lauren Montgomery, actress Gal Gadot, and several historians focused on the character gather together for a discussion about what she represents to women and how she has adapted to progressive perceptions over the years. It's a general glimpse at the character, not specific to the 2009 film whatsoever, and offers little high-definition snippets from the live-action movie interspersed with animation clips. Pleasant, but not worth pursuing. The other inclusion, in the tradition of other DC animated films, is a Sneak Peek at Batman and Harley Quinn (9:08, 16x9 HD). which reveals how this latest animated film has strong ties to the classic Batman: The Animated Series. Barring a few character flaws and some iffy superhero-movie logic, DC's animated Wonder Woman origin story still holds up as both a bracing representation of the empowering female heroine and as a lively mythological action film. 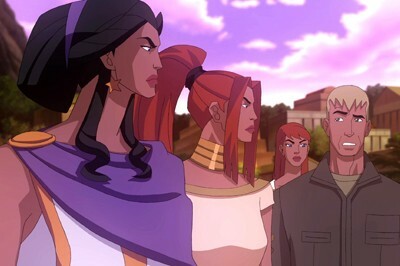 Keri Russell deftly balances the many tones comprising Diana in her voice-acting, while DC's animation style hits many high notes with its assertive battle sequences and gorgeous scenery. Wonder Woman's relationship with Steve Trevor stumbles due to the embellished nature of Nathan Fillion's overly roguish projection of his character, and certain action sequences meet convenient ends that detract from the story, but the qualities of Diana's character and the ways in which the script explores and exploits high-fantasy and mythology more than makes up for it. The film itself comes with a firm recommendation; however, the Commemorative Edition Blu-ray -- pictured here in Target's exclusive steelbook -- offers the same audiovisual presentation and only one new, fairly generic and totally passable featurette about the character. Rent It if you want to check out the new extra, but I'd recommend just buying the hardcover book + movie edition or sticking with the previous Blu-ray.